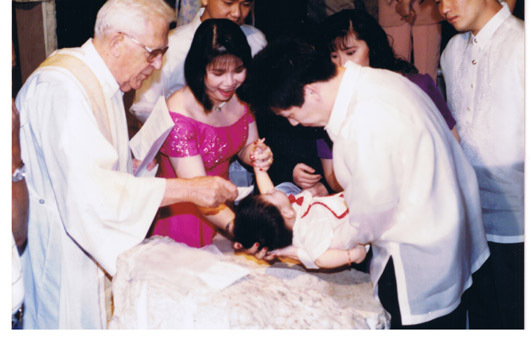 Baptism is a sacrament of Christian initiation that gives our souls the new life of sanctifying grace by which we become children of God, members of the church, and heirs of heaven. It is the first of the seven sacraments not only in time (since most Catholics receive it as infants) but in priority, since the reception of the other sacraments depends on it. For Catholics, the sacrament is not a mere formality; it is the very mark of a Christian, because it brings us into new life in Christ. It takes away original sin and all actual sins, together with all the punishment due to them. It gives us the grace of rebirth and the infused virtues. It raises us to the dignity of adopted children of God. It incorporates us into Christ and His Church. It confers on us the baptismal character and the right to heaven. To be baptized is to be given new birth and new life (John 3:5). Symbolism of the Holy Water. "Baptism of water"- is the ordinary means of Baptism, but there are two extraordinary means by which the remission of sin and the attainment of eternal salvation are possible. Those who through no fault of their own, have not received the sacrament of Baptism can be saved through what is called Baptism of Blood or Baptism of Desire . An unbaptized person receives the Baptism of Blood when he suffers martyrdom for the faith. Martyrdom means the patient acceptance of a violent death, or an assault, which, of its very nature is likely to lead to death, for the sake of Christ: defending some point of religion and teaching of Christ, giving witness to a particular Christian virtue, etc. An unbaptized person receives the Baptism of Desire when he loves God above all things and desires to do all that is necessary for his salvation. If someone believes and loves God above all things, is sorry for his sins, and ardently longs for Baptism when it is impossible to receive it, he is said to have received the Baptism of Desire. As the Baptism of Desire and Baptism of Blood are extraordinary means, they do not excuse from the obligation of making use of the ordinary means when available. For this reason, one who has received that Baptism of Desire by an act of love or perfect contrition, is still bound to receive Baptism of Water if he is aware of it. In the same way, an unbaptized person being martyred for the Christian faith or some Christian virtue must be baptized by water if he survives. Water is the obvious symbol that we associate with Baptism, representing life, death, cleansing and growth. It is interesting that our initiation process begins with water just as the beginning of time portrayed in the very first pages of the Bible. 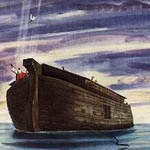 Consider, for example, the flood waters of Noah's day and the saving waters of the Red Sea parted by Moses. Those waters of the Red Sea, even if they killed the Egyptians, opened the way for the Israelites to pass from slavery to freedom, and later crossing one more body of water (the river Jordan) to pass into the Promised Land. Water and Spirit are strong and important symbols of Baptism. To be baptized is to be plunged into the waters and to open oneself to the Spirit of Jesus. To be baptized is to have the Spirit help us make order out of the chaos of the sinful world into which we are born. To be baptized is to be welcomed into the Church (the new promised land) and to be nourished there as we journey with each other and with Jesus in his ministry. In present day, Baptism is administered by pouring water on the forehead of the person to be baptized, saying while pouring it: "(N.), I BAPTIZE YOU: IN THE NAME OF THE FATHER, AND OF THE SON, AND OF THE HOLY SPIRIT." Immersion - means plunging the candidate into water. Infusion - means pouring the water. Aspersion - means sprinkling the water. All these three methods are valid, but our present practice is by immersion or infusion. This is clearly stated in the new Code: "Baptism is to be conferred either by immersion or by pouring, the prescriptions of the conference of bishops being observed." Water must flow over the skin, so that not every sprinkling or pouring suffices for the Sacrament. If the water just flows over the hair, the validity is doubtful. The normal procedure is to pour water three times in the form of a cross over the head. In urgent cases, it is only necessary to pour the water once. If there is only one drop of water available, and the case is urgent, the water should be rubbed over the person's forehead with the finger. This, of course, would be of doubtful validity. If the person recovers, Baptism should be repeated conditionally. 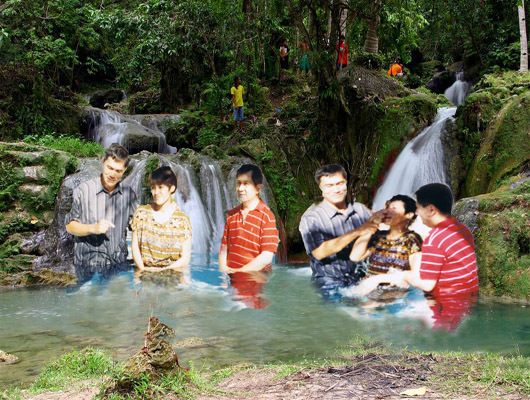 Any person who is not yet baptized can be baptized. That person is said to be the "subject" of Baptism. A person who has reached the age of reason - normally around seven years of age - cannot be baptized validly unless he has the intention to be baptized. An adult cannot be made a Christian against his will. The main argument for the perennial practice of the Church regarding infant Baptism is the absolute necessity of the Sacrament for entrance to heaven. If Baptism is necessary for salvation, it must be administered to infants as well as to adults. If not, we would be guilty of thinking that God had deprived infants of every means of salvation. The ordinary minister of Baptism is the bishop, the priest, pastor and the deacon. In case of necessity, as in imminent danger of death, and no priest or deacon is available, anyone with the right intention may and should administer Baptism.